Our King vs. Queen bed size comparison is intended to help those who are unsure of their best option: King or Queen size? The only difference is the width and the question most people ask about. If there is only 6 inches difference in width, why do we need both? Why not just use the King and be done with it? This comparison is intended to answer that question, and clarify the need for both. First, let’s have a quick look at the difference between the two bed sizes. Here is a comparison chart explaining the Queen vs. King mattress or bed sizes. Generally, you would use a base, foundation or frame designed for the size of mattress you prefer. Therefore, for the purpose of this comparison, the terms Queen mattress and Queen bed refer to the same thing. It should be clear that the only difference between a Queen and King size bed is the width. Couples generally prefer the King size, unless their bedroom is too small to accommodate the extra 16 inches. Some singles prefer the Queen for the extra width it offers, while most couples might find it just a bit too snug for two people. Here are some comments on specific aspects of the two bed sizes. The dimensions of the beds and of the sleepers have a bearing on which is preferred by whom. There is a significant difference between 60 inches and 76 inches. The King size bed is most suitable for larger bedrooms. When choosing your bed size you have to keep in mind the other furniture you may have in your bedroom. You need a fairly large area to accommodate an armoire, dresser, chest of drawers and two nightstands. Add an ottoman and any other furniture, and you may be pushed to accommodate a King size bed. Some people have to compromise on the incidental furniture to be able to have a King size bed in their room. In fact, many do, because two large built people would likely find a Queen size bed too small for them. When designing the furnishings in your bedroom, decide first on the width of the bed you need, then after that choose what other furniture can fit into the remaining space. Most couples will prefer the King, but many will likely have to settle for the Queen size bed due to a lack of space in a smaller bedroom. Many single people like a Queen size bed for the extra space it offers them, and it also provides the width to accommodate an extra person when needed. The extra width allows extra comfort. A King size bed is certainly too wide for an individual, but a Queen size mattress offers more ‘spreading out’ space than a smaller mattress. Comparing a Queen size bed with a King size isn’t really a fair comparison. Most people would never buy a King size unless they needed the extra width – and that is only needed if you sleep with a partner. However, assuming that their bedroom can accommodate it, many singles would prefer a Queen size bed to a single or full size. It’s having that extra spreading out or sprawl area that makes the Queen so attractive to many single people. Another reason for choosing the Queen size is for a spare bedroom. You never know whether your spare may be needed for a single person or a couple. Many who entertain a lot like to have a spare room for anybody wanting to stay overnight. 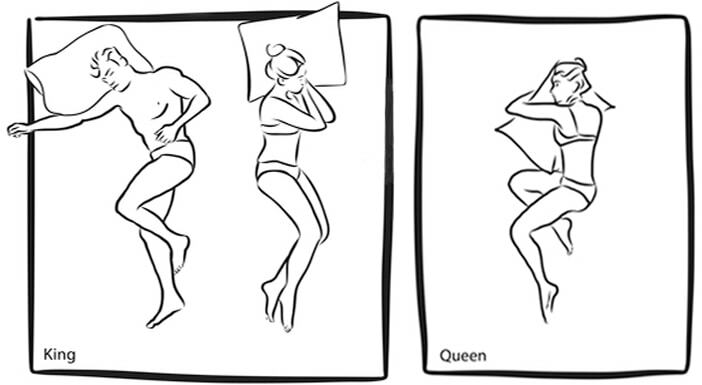 In this situation the Queen is ideal: it can be used by a single sleeper or a couple. As has been inferred above, the size of the bedroom has a large influence on the dimensions of the bed. The recommended minimum room space for a King size bed is 10 ft x 14 ft. At 80″ long and 76″ wide, this leaves 40 inches space lengthwise and 92 inches space sideways. This equates to 46″ (3ft 10in) each side of the bed. This is plenty space for two small nightstands and maneuvering around the bed but not for anything else. The recommended minimum space for a Queen size bed is 10ft x 12 ft. At 80″ long and 60″ wide, this leaves the same 40 inches lengthwise and 84 inches sideways, or 42 inches each side. Neither of these sets of dimensions leaves much space for other forms of furniture. One nightstand each side would fit in, and perhaps a narrow dresser opposite the bottom of the bed. So even a Queen size bed in a 10 ft x 14 ft room would leave little space for other furniture. That is one reason why so many couples tend to use a Queen size bed in all but the largest bedrooms. So the choice between a King vs. Queen bed size is not always one of preference, but one of expedience based on the dimensions of the bedroom. King vs. Queen Bed Size: Which is Best For You? If you sleep with a partner, then go for the King size bed. The Queen size may accommodate you both but is not recommended. If you sleep alone then the King size is too big for regular use – the Queen is to be preferred. The same is true if you have a spare bedroom. Sure, you could have a King size bed in there, but a Queen size bed would be the sensible choice. It is suitable for both singles and occasional overnight stays by couples. The nearest to a Queen is a Full size, but at 52″ x 75″ this is way too narrow for couples. It is an option for a spare room, but if you have the space for a Queen size spare room then why not use it! A King size bed will be more expensive than a Queen size to purchase, although not by much. The same is true of the bedding: mattress covers, toppers and protectors, quilts, duvets, sheets and so on – they will be slightly more expensive than Queen size accessories, but not by much. So: King or Queen? The answer boils down fundamentally to the size of the bedroom. A Queen or King size bed should fit into most modern bedrooms, although some smaller rooms may restrict your choice to the Queen size. You can either imagine your bedroom with all the furniture you want in it apart from the bed, then establish what size of bed would fit: King or Queen – or make a scale drawing. Some people make a scale drawing of their bedroom, then cut out rectangles relative to the dimensions of their other furniture: dresser, nightstands and so on. Once these cut-outs are fitted into the room, you can try scale cut-outs of Queen and King beds. That will assist you in coming to a decision: King vs. Queen? There’s not much in it to be honest!